Many real, brick and mortar, shops have Web sites on the Internet now, selling products not only at the real shop, but also on the Web site too. So low cost and simple solutions to integrate the Web site and the POS system for a shop is expected. This application shows a solution especially targeted for a fast food shop with Web ordering. The Web server on the Internet provides shop information to customers about menu (products), location, company information and so on. Then it takes the orders to deliver or pick up at the shop. The received orders are placed in a certain folder for each shop at the Web server. At that time, the order data is written by XML data. The POS application is a Web based POS application, which means the POS application runs on a Web server on the Internet or at the shop locally, e.g. the built-in Web server at TM-i. Mobile terminal(s), e.g. 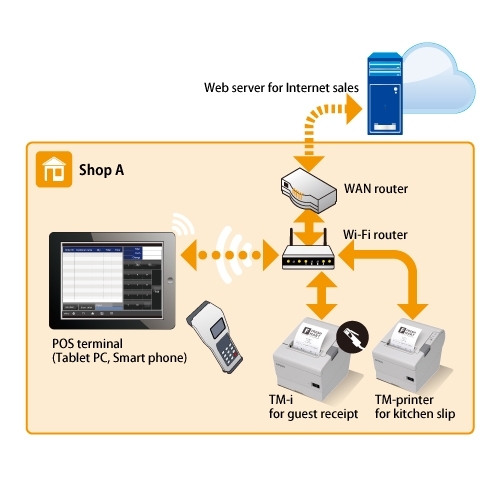 a tablet PC and/or a smart phone, access the Web based POS application using a browser, then work as the POS terminal. By Server Direct Print function at TM-i, the order data at a certain folder of the Web server on the Internet is searched periodically, then automatically downloaded to a certain folder at the TM-i. The POS application checks the downloaded order data. When the data is found, the POS application inserts the date on the order table, then displays the data as the new order at the screen of POS terminal. Additionally the POS application identifies ordered items within the data, then prints out kitchen slips for each item at kitchen printer(s) using Epson ePOS SDK and Printer Hub function (or displays at kitchen monitor). The direct taking of an order at a shop is also possible. At that time the order details are recorded at the POS terminal; then the order is added on the order table, too. o When all items for a new order are ready to deliver or pick up, the operator will take the action on the POS terminal to close the order and print out the customer receipt at the TM-i.